Comics are weird when it comes to video games. Part of it’s because the two are vastly different media, with the closest crossover being either choose-your-own-adventure comics or sprite comics, depending on which aesthetics or features from one you prize in the other. Likewise, very few comic book based games actually try to translate the medium, with the notable exception of the old Genesis game Comix Zone. You’d think they’d be a natural fit for each other, but they just never seem to merge properly, and the reasoning is that video games have replaced the superhero comic as the youth-fixated media of choice, and they have been this way for quite a long time, and so a superhero comic featuring heavy video game elements can’t help but feel a little how_do_you_do_fellow_kids.jpg. That brings us to American Chibi, the big-headed bundle of joy that has been a frequent quest star in the relaunched series. This is her origin. And also her final battle. And her rebirth. Comics! It starts with a normal day for Honor Guard, battling video game monsters that fit in a video game logic world – they show up out of nowhere and they look cool and have a satisfactory death animation, because the ecology of most video games world don’t make sense for a minute any more than the ecology of any superhero comic ecosystem does either. Soon enough, they run into American Chibi, who informs them that she knows where they all come from – an independent video game designer named Marguerite Li who’s been obsessed with creating the perfect platformer. This obsession is fueled by monsters called the Unbodied, who are gods without believers, trying to pour themselves into new shapes as they hunger for human belief (which is extremely Pratchett, but: steal from the best.) American Chibi manifests whenever Marguerite is unconscious, like a version of Sleepwalker with better hair, and so, the threat identified, the heroes go to stop it at the source. … oh God they are an army of Funko Pops, they are in Hell. 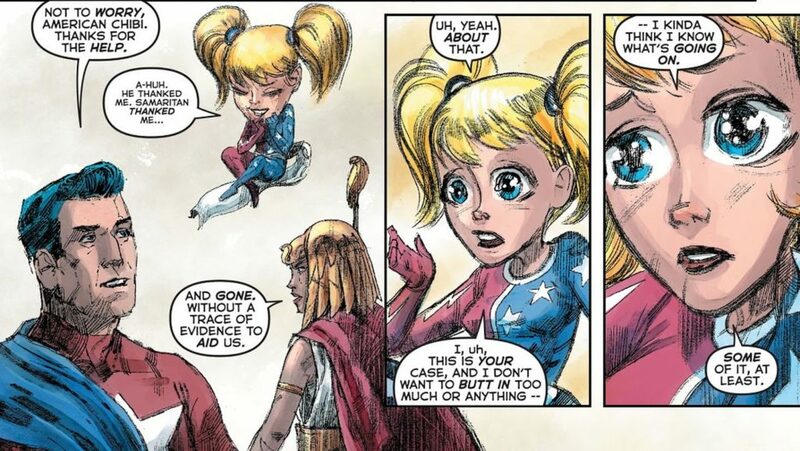 The only one who looks normal in this Hellscape from which no light nor heat nor hope can escape is American Chibi, who I adore even if she is a little problematic (we’ll get to that.) 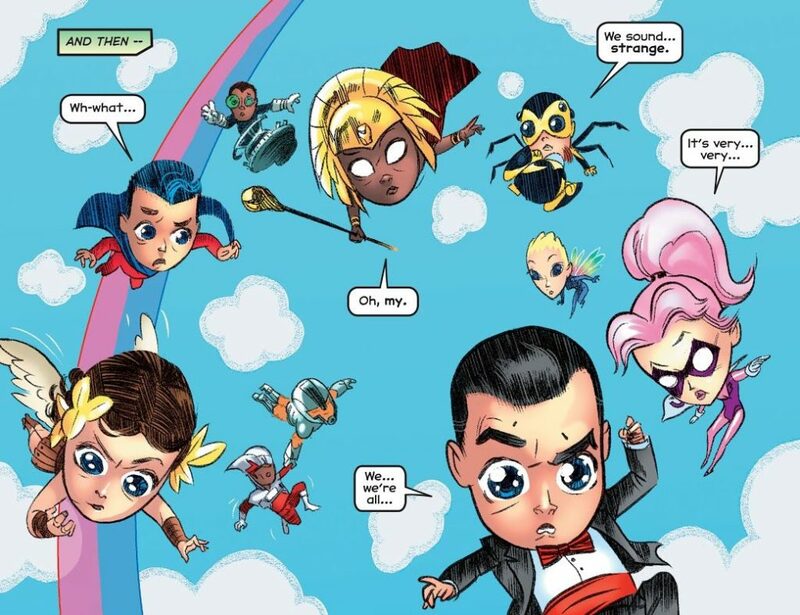 Chibi is one of those kinds of characters, the kind who emerge when there’s a trend, like how there are disco themed villains and pinball themed villains and one Green Goblin villain (yes, there was a hero Green Goblin) whose schtick was pogs. 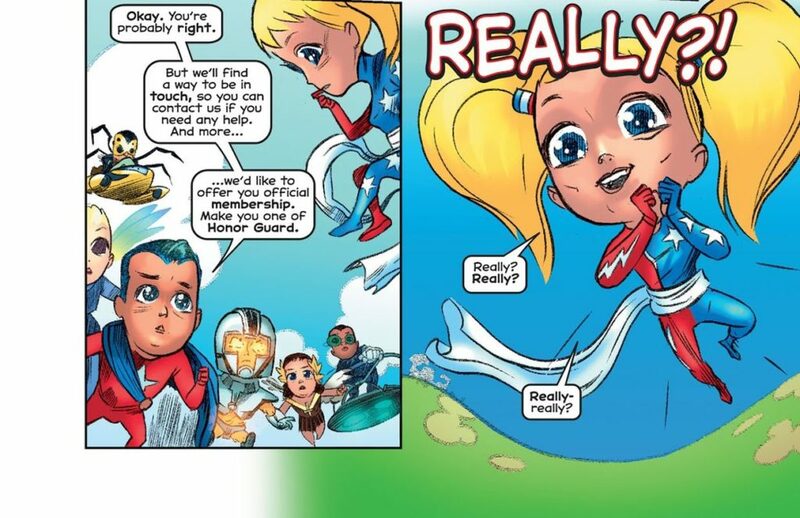 The chibi became part of the culture, and so, there had to be a chibi-themed superhero. If American Chibi did not exist, it would be necessary to invent her. 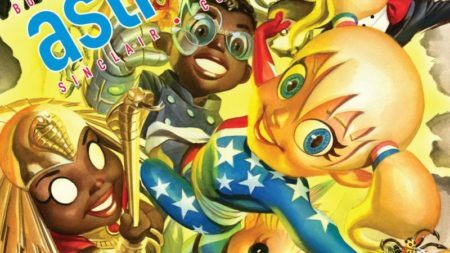 While in the realm of Ibbopolis, Honor Guard and Chibi battle the Unbodied, and Chibi gets a sense of why she was created – or at the least, brought to life from fiction to fact. The Unbodied created Chibi to be an unwitting bridge to the other side, a hero whose mere presence lays the groundwork for villainy. It would smack of more “Batman creates his villains” eyeroll-inducing, but for how it’s handled, because Batman comics can’t really follow that line of thought through to its conclusion the way that this comic can. … though not before Honor Guard grants her the fondest wish she can think of. 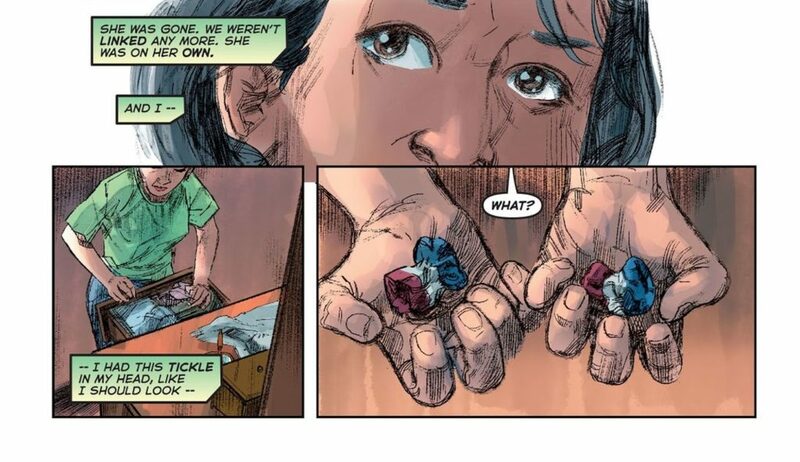 Her magical hair scrunchies are in her drawer. And they work. Reading this ending, I’m reminded of one other comic book that dealt with video games and the language therein: Scott Pilgrim, by Bryan Lee O’Malley. Not just for the video game references or the big-head art style, but for a Tumblr ask that Bryan Lee O’Malley answered some years back, in which he admitted that he’d managed to whitewash himself out of his own comic book – that he’d read the universe as mixed race, but that it had read as white to white audiences, including those that adapted it into a film, because he hadn’t been explicit enough with his cartoonish style about where the characters came from. 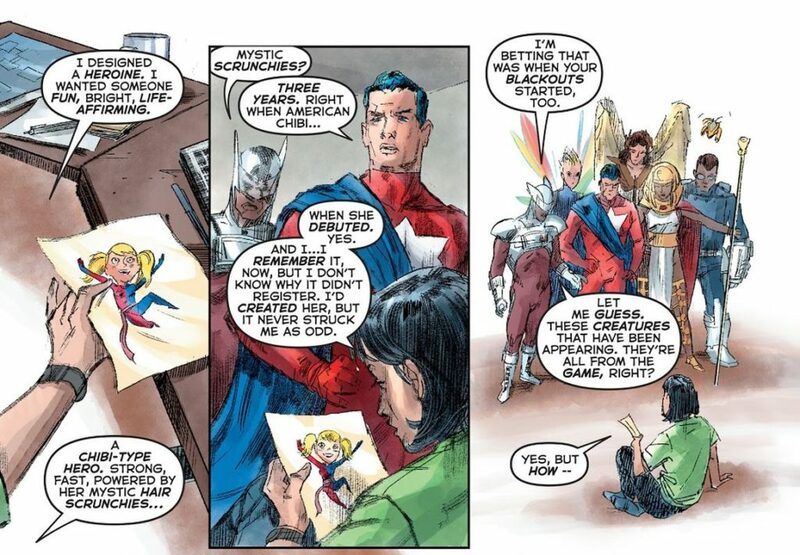 … but thanks to the magic of superheroes, suddenly Li’s not the one who created a superhero who’s whitewashed – she is the superhero, and need not be anything other than herself. 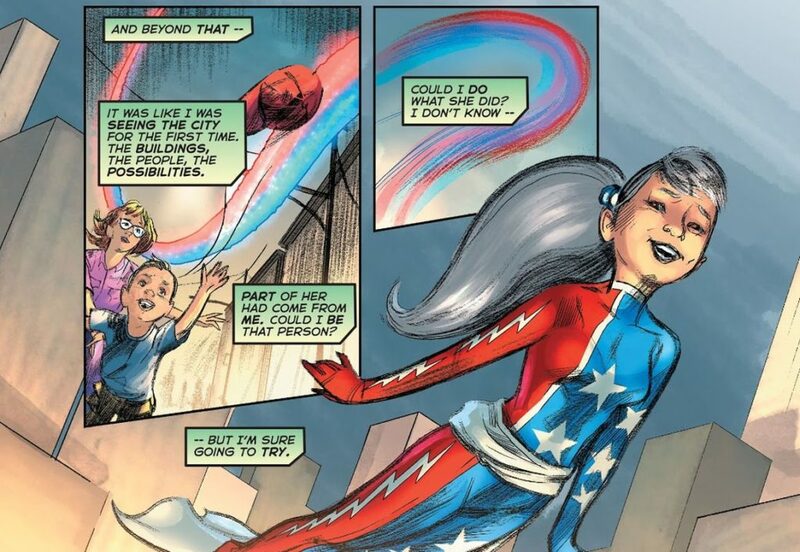 And, in a wonderful touch, the hero whose legacy she fulfilled is the one she created. 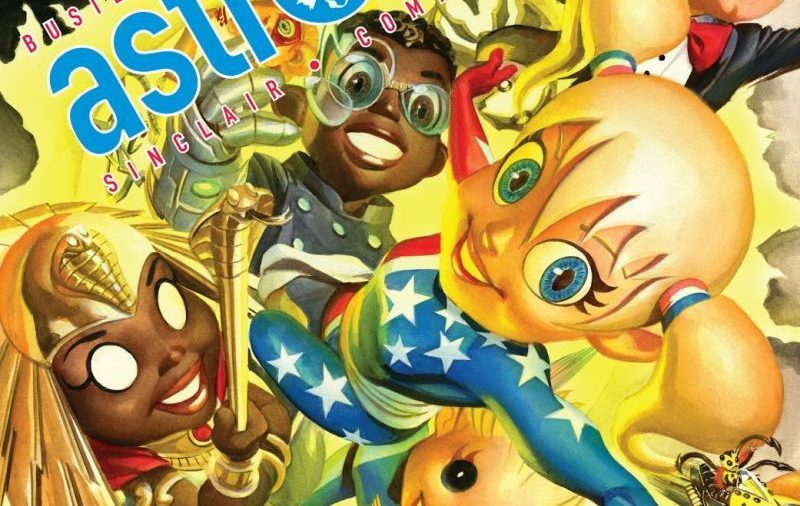 So much of this span of Astro City has been about new characters stepping into the boots of their legacies, and this is probably the best example yet – a legacy that didn’t even exist the last time we checked, and that now is reborn in a more diverse, interesting form. All of this in 22 pages, plus side appearances. 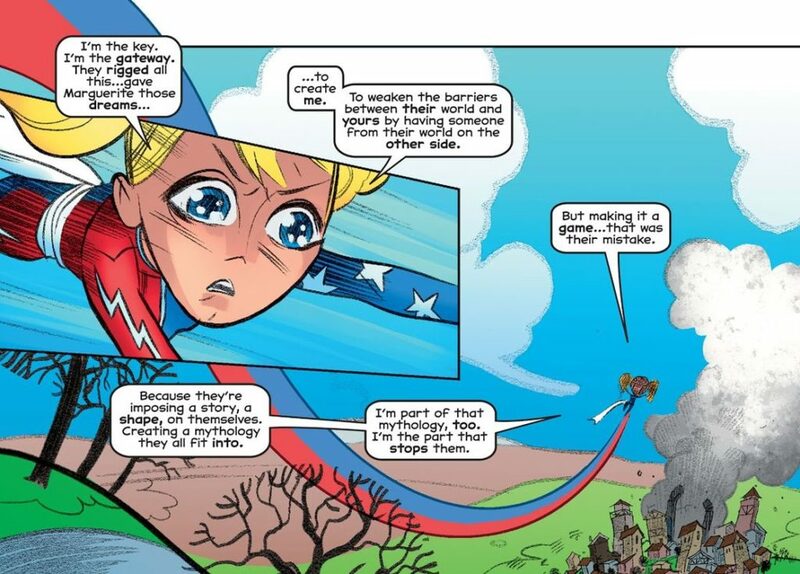 One thing about comics is that compared to video games, they’re over and done with quickly. Now, if you’ll excuse me, it’s time to pour another hundred hours into filling in a map in a Ubisoft game. Next week: Wolfspider! Is he wolf or spider or… is he both! ?